Though we’re regularly exposed to poisons and toxins in our food (think the bitter taste in coffee and tea) and on the airwaves (think Alice Cooper’s “Poison” and Britney Spears’s “Toxic”), we often don’t realize how widespread and influential they’ve been in shaping our society. Even as far back as the 16th century, the Swiss-German founder of toxicology, Paracelsus, noted, “All things are poison, and nothing is without poison.” Until Aug. 10, you can visit the American Museum of Natural History’s exhibit The Power of Poison, and explore some of the paradoxical roles that poisons play in human life. At the beginning of the exhibit, visitors are led through a recreation of a Colombian rainforest called the Chocó, and treated to a spectacle of exotic curare vines, spirit gardens (areas of the forest where ant ‘janitors’ poison all but one variety of vegetation), and alert, but motionless yellow frogs. Though this virtual shady jungle world may evoke a sense of wonder, its real equivalent would not be a safe environment for humans, since all these organisms survive using an arsenal of deadly poisons. This is particularly so in the case of these frogs, whose skin contains a fatal poison 250x the strength of strychnine, and is used to coat arrow tips. However, in the interest of objectivity, the exhibit directs its visitors to consider the benefits man has reaped by harnessing the power in these poisonous elixirs, as well as elucidating the potential dangers they can pose to us. For example, surgery would still be an excruciatingly painful experience like it was in the mid-19th century, were it not for a compound that scientists isolated from the deadly, aforementioned, curare vine. The compound, tubocurarine, has revolutionized surgical procedures since its use began in the 1940s, because the previous muscle relaxants available to surgeons would almost paralyze the patient’s breathing center, posing a severe risk of death. Poisons have fascinated people long before we began to understand them in the scientific detail that we do now, and story crafters have frequently made use of them as chilling plot devices. 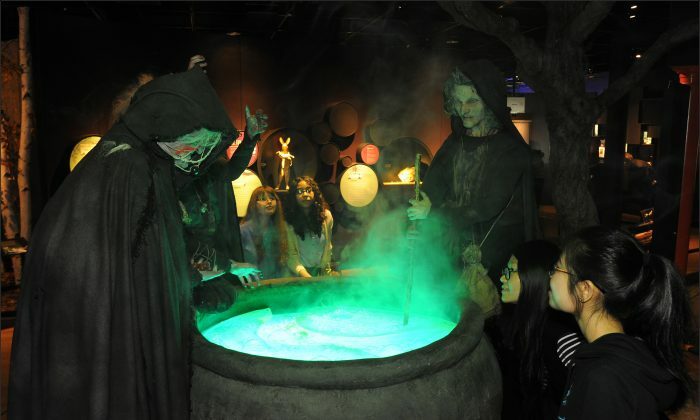 As the exhibit transports its visitors out of the murky rainforests and into an eerie realm of fantasy and fiction, an objective eye is trained upon the potion ingredients recited by the witches in Shakespeare’s “Macbeth” [“Eye of newt, and toe of frog, Wool of bat, and tongue of dog, Adder’s fork, and blind-worm’s sting, Lizard’s leg, and howlet’s wing, and so on”]. Instead of merely being a list of macabre cauldron-fillers, scientific scrutiny suggests that they were all in fact plant ingredients rendered in poetic form. For example, “Tongue of dog” more than likely referred to wolfsbane, an herbaceous plant historically used to kill wolves. The scientific fascination with witches’ potions has extended through history, and even resulted in a German researcher’s death in the 19th century, after he prepared a 15th century witch’s flying ointment recipe, and drank it. However, the black art of poisoning wasn’t the sole domain of cackling crones. Historical cases of famous emperors and pharaohs who employed poisoners, or succumbed to poison themselves, are depicted in the exhibition. A key contributor to Western thought, Socrates was sentenced to death by drinking poison hemlock, on a charge of promoting disbelief in the gods of the state among Athenians. Even divinities were known to dabble in poisons, as the goddess Isis is fabled to have poisoned the sun god, Ra, in order to gain his secret name. Mercury, a poison relevant to our lives on account of its increasing presence in seafood, is explored in depth. However, in ancient times when its toxicity wasn’t known, its mysterious liquid property enticed Emperor Qin Shi Huang (260 B.C.–210 B.C.) with fatal consequences. Thinking it contained the key to his immortality, he drank so much of it that it eventually killed him. Metal drinking hasn’t lost its appeal yet however, and recently, colloidal silver has been thought to confer health benefits, although adherants may suffer the inconvenience of having their skin turn blue. At this point in the exhibition, those itching to leave the distant past and reconnect with our computer-generated-imagery-saturated era will be pleased when a toxicologist curator delivers an engaging “CSI” presentation. Lacking some of the glitz of our modern Hollywood editions, however, this account details a 19th century arsenic poisoning, which a doctor solved by devising a test that is still used in forensic science today. Visitors are also given a chance to interactively test their knowledge, when various poisoning cases are presented on computer screens. Being perhaps of most relevance to today’s health-conscious society, the final section of the exhibit displays a tank full of live, poisonous marine animals, and a pictoral depiction of exotic creatures that have captivated the interests of today’s medical researchers. These organisms produce a variety of exciting compounds for scientists to study, in the hope that they’ll be applied to the treatment of diseases that are, as of yet, lacking effective cures. Drug companies and researchers are mining these potentially lucrative reservoirs or treasure-troves of natural chemicals and have yielded some potentially positive results. Some examples include the study of the death-stalker scorpion for its reserves of a neurotoxin that binds exclusively to cancer cells and the 300 compounds of Fraser Island funnel-web spider venom, which are being researched as a treatment for breast cancer. A thought-provoking and stimulating exhibition, The Power of Poison will be informative, educational, and suitable for all ages. It’s a rewarding way to spend a few hours at the American Museum of Natural History, however, princesses seeking their handsome prince would be advised not to kiss the yellow frogs. The museum is located at Central Park West and 79th Street; Open daily from 10 a.m. to 5:45 p.m.